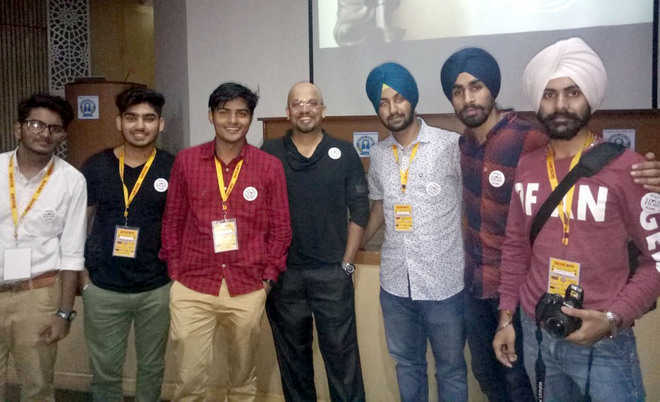 The Day 2 of the Bioscope Global Film Festival being held at the Guru Nanak Dev University was a mix of unique flavours from across the world. From the celebrated Swedish short film ‘The Shadows Await’, which captures the subject of rights of immigrants, to the highly-appreciated Iranian short film ‘The Last Embrace’ that deals with the issue of smartphones replacing human relationships, the films screened presented concepts that broke stereotypes and brought out some lesser talked about subjects to the fore. The foreign language films screened included French independent film Teenagers, Portugese film Alfaiao, award winning Iranian short films Forouzan and The Last Embrace among others. In the Indian cinema category, biographical docudrama ‘Admitted’ by Ojaswaee Sharma stole the show as it highlighted the journey of transwoman Dhananjay Chauhan. Iranian short film ‘The Last embrace’, directed by Saman Hosseinpour, was also received well as it narrated the story of a young girl, who wants to show her drawing to her family. Since each member is busy on his/her smartphone, the girl goes to her ailing grandfather, who dies without anyone noticing, only after embracing her for the last time. Another short film ‘The Shadows Await’ from Sweden too brought out the problems being faced by immigrants across the world through a sensitive portrayal. A story of a little girl, who sneeks out of her home at night to play and read a comic with her friend, who is facing deportation, the film garnered applause from the audience, mostly students. ‘Admitted’, the story of Dhananjay Chauhan, the first transgender who took admission in Panjab University and paved the way for others to follow, too was celebrated for its concept. Made by Chandigarh-based filmmaker Ojaswaee Sharma, the feature film talked about the rights of transgenders and the need to accept them as part of society. If the inaugural day of the festival celebrated feature films, mostly regional cinema, Day 2 belonged to the short films. ‘The kind of concepts and content screened were amazing and refreshing. Some of these films made so much sense as they highlight the problems being faced by global citizens,” said Ayush Bhardwaj, a student of theatre. Punjabi short films Maa and Ik Taara Hor also managed to get a packed house of audience. Meanwhile, some of the filmmakers, including Bobby Vats, from the Hindi short film Color of the Shadow, and makers of Hindi/English short film Tashi interacted with students.